We’ve been seeing quite a few leaks lately pointing to the very real possibility that LG will be opting for a QHD “2K” display in the upcoming LG G3. Last week, a screen shot from the device showed us, not only a new minimal, “flatter” user interface, but it was the second time we were presented with alleged screenshots captured in — you guessed it — 1440 × 2560 resolution. If you needed further confirmation that LG will be kicking off the 2K spec arms race, Ubergizmo has allegedly received the first photo of the device pictured in the wild (well, a portion of it anyway). 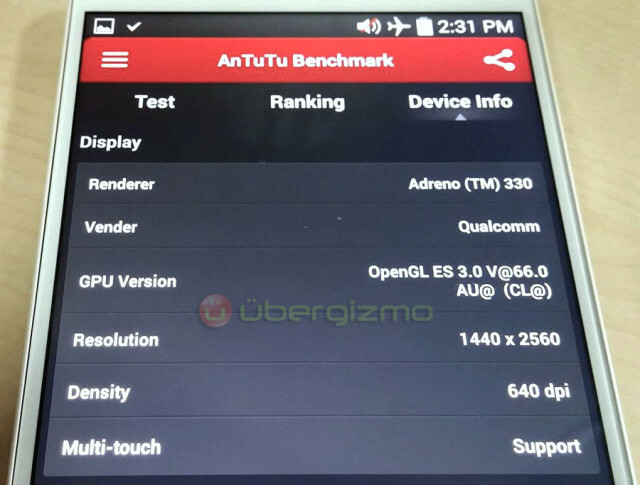 The picture, taken of the device just after it finished an AnTuTu benchmark to completion, lists off a few of the device’s specs, including its 1440 x 2560 resolution display (although the reported 640 dpi could be an AnTuTu glitch). What’s more is LG was reportedly able to confirm the resolution of the device to UberGiz. Last week, we saw the a possible LG G3 variant for Sprint pop up in a user agent profile (LG LS990). While the device listed a Snapdragon 800 processor, it’s entirely possible it was prototype device for network testing and LG will ultimately pop in an 801 in time for its consumer release.